Madondo’s goal scoring form has helped Jinja SS into semis. Courtesy. In Coca-Cola post-primary schools football you just can never write off Kibuli SS. Never. They are the record champions. And like 2017 hosts Masaka SS found out the harsh way, yesterday, Kibuli can lose their nerves to the extent of clashing with a referee over a decision, concede from the spot… That is not all, they can even lose two players to red cards in the first half, but once they put their heads down to work, defeat is not their breakfast. The defending champions suffered a scare against a gritty Masaka SS side when they conceded a penalty and lost two players to send-off, with many watching from Masaka Recreation Ground all but writing off Kibuli. Not Kibuli themselves. The schools football powerhouse went on an exhibition of football grit that saw them battle with only nine men for nearly an hour to eventually dump out Masaka SS in post-match shootouts. Yesterday’s morning quarterfinal clash started with the odds basically pitted at 50-50 as hosts Masaka SS were good to provide the kind of challenge Kibuli would have to sweat to overcome. Masaka were hoping to better their semi-final exit last year. But Kibuli would have none of it. KCCA youngster Allan Okello wasted little time in weaving his magic, finding Adam Musisi in space and the Kibuli forward scored a beauty to put the defending champions in the driving seat. But moments later, the hosts were awarded a penalty that danger man Okoa converted. But not without incident. Kibuli players were riled and went to near brawl with the centre referee as the contested the decision. Police had to deploy momentarily, firing some volleys of tear gas canisters to manage the fans. When all was calm again, goal scorer Musisi and Captain Fred Tabu received their matching orders. Kibuli managed to hold their nerves as Masaka SS probed for a winner in vain, forcing the match into shoot-out lottery. Kibuli made the most of their luck count as they dispatched off the hosts, who could only convert once en route to losing 3-1. 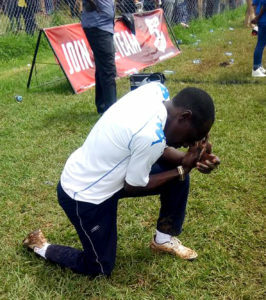 Kibuli SS team doctor Jack Walugembe was too tense to follow the penalties. Courtesy. In the other semifinal, wasteful St Mary’s Kitende needed to hold their nerves in post-match shoot-outs against Dynamic SS Sonde. Kitende’s goalkeeper Eric Kimbowa proved the hero, saving Fahad Nsamba and Mustafa Toto’s penalties to send Kitende through 4-3. Meanwhile, Busoga region will have only Jinja SS in the semi-final today after Jinja Progressive were sent packing Nakaseke International College. The tournament’s dark horses ran out 2-0 winners to set up a mouthwatering clash with Jinja SS. Nakaseke knocked out St Juliana Gayaza in the round of 16. In the other game, Citizen High School, who knocked out blessed Sacrament Kimanya in the round of 16, ran out of both luck and steam and turned into cabbages that only served Jinja SS the easiest quarter-final encounter. Joel Madondo, the sleek-footed package that Jinja SS has unleashed upon the tournement, scored a hat-trick, with Ivan Wani and Ibrahim Sajjabi completing the 5-1 rout. The Jinja school, led by the tournament’s leading goalscorer in Madondo (11 goals), play Nakaseke International in the first semifinal at 2pm today. The first semi-final will be like a curtainraiser for the day’s biggest post-primary soccer rivalry when champions Kibuli SS take on tournament favourites and school power house St Mary’s Kitende in a repeat of last year’s final in Soroti where Kibuli emerged victourius. The Kibuli-Kitende semifinal at 4pm will bring together young starlets Zaga (Vipers) and Allan Okello (KCCA).